Brian McLaren has emerged as a voice that asks aloud the questions that many of us have wrestled with in silence. As a result, he has been lionized (and sometimes idolized) by those who find resonance with his theological ponderings. He has simultaneously been demonized and even slandered by those who are disturbed by his explorations into what it means to follow Jesus in the 21st century. He has become both an antenna and a lightning rod for the light and heat generated by the friction of Christianity's transition into post-modernism. 1. 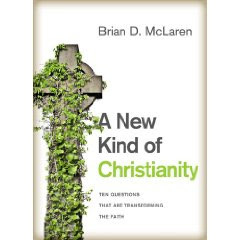 "Essential" in the sense that A New Kind of Christianity is a streamlined and tightly focused distillation of ideas that McLaren has explored elsewhere. This book seems to contain the concentrated essence of what McLaren's theological labor has produced thus far. I often found points which he had sketched out in previous books now re-drawn in sharp, clear and muscular form. As a result--at under 300 pages--this book packs a great deal of theological, intellectual and inspirational punch. 2. "Essential" in the sense that A New Kind of Christianity is the Brian McLaren book to read, whether you haven't read anything else by him or whether you have read everything else by him. 7. Can we find a way to address human sexuality without fighting about it? 9. How should followers of Jesus relate to people of other religions? McLaren doesn't so much provide pat answers to these questions as give thoughtful responses which leave the door open for further exploration. His tone throughout is humble, circumspect and low-key. This is not a book for people who want a pedagogue to tell them what to believe. Rather it inspires you to bring your own theology into the light and take an honest look at what you believe, why you believe it and if, perhaps, you ought to rethink a thing or two (or ten). As an example, early on McLaren provides a brilliantly simple visual representation of the Biblical narrative according to Western "Greco-Roman" Christianity (aka Catholicism & Protestantism). He then proceeds to carefully deconstruct that "Greco-Roman" narrative and present an alternate "Hebrew" narrative which is vibrant, hopeful, appealing and, frankly, makes a whole lot more sense. One begins to realize that this "New Kind of Christianity" is also very ancient. The new narrative that Brian postulates is utterly Christ-centered. At its core is the idea that Jesus is the revelation of God. If we want to understand what God is like, we ought to give our primary focus to seeing what Jesus was like, and not lose sight of that. This book will either excite, edify and motivate you or it will scare you (because it challenges the status quo--as Jesus nearly always does). 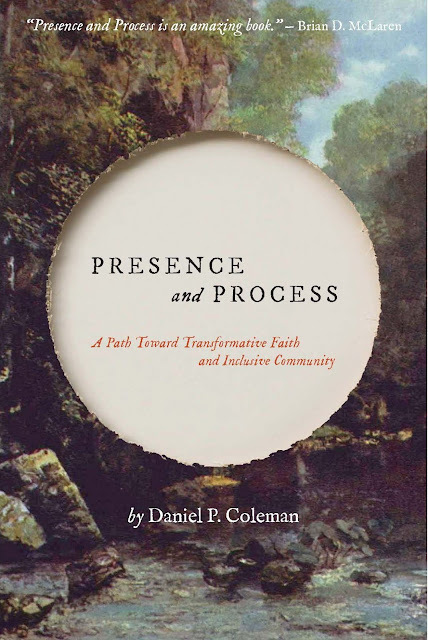 As a Quaker, I found myself surprised at the parallels to Quaker theology which I found all through this book. I had an opportunity to ask Brian about this on a conference call and he responded very enthusiatically. He is quite familiar with the theology of Friends and spoke in glowing terms of Quakers. Perhaps George Fox & Co. were at the far bleeding edge of what has come to be called the Emergent Church Movement! In the book, McLaren refers to those throughout Church history who, like the Quakers and Anabaptists, provided a "minority report" on what it means to follow Jesus. On that same conference call, McLaren said that it took him far longer to write this book than any other book he has written. It shows. Now that I have finished reading it, I plan to begin re-reading it immediately. This is an extremely important book. Buy it. I am not exaggerating when I say that if I could afford to, I would get a copy for every Christian and every spiritual seeker I know. 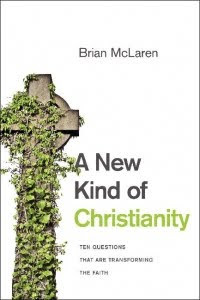 Brian McLaren's new book, A New Kind of Christianity, was released today. I'm already on chapter 7. It's really, really good. "'Bad' theology, as you put it, does allow people to rationally arrive at all kinds of terrible conclusions. I am not clear yet, however, that the fact that one's theology includes the belief that God loves his creation and values every single person, will necessarily affect how one looks at the world and treats people. I see so many people, and I am sure you do, too, whose theology includes these beliefs but whose lives are not a testimony to them, in whose lives these beliefs are not manifest." I wanted to respond to Tmothy's comment, but realized it would probably be better to devote a new post to doing so. I'd like to give an example of how the belief that God loves his creation and values every single person affects how one looks at the world and treats people. Several aspects of theology came to mind, such as Eschatology ("If Jesus is going to return soon and burn up the earth, why worry about global warming? "); or Atonement via Penal Substitution (aka "Jesus takes the punishment from an angry God on our behalf"); or Israel ("Does God prefer one ethnic group over others? "); or how God judges sin ("God sent the earthquake to Haiti and killed 100,000 people--including Christians--because their ancestors made a deal with Satan. "); or Original Sin ("Sorry, the moment you were born you were guilty and condemned. "), etc. All of these doctrines lead to a negative view of mankind. It could conversely be assumed that eschewing these doctrines might improve one's outlook about the world and mankind. I decided instead for this post to focus on the doctrine of Hell. I spent several years studying Hell: What the Bible taught about it; what early Christian theologians taught about it; what the Church throughout history has taught about it; what other religions that preceded or were contemporaneous to Judaism and Christianity taught about it; etc. What I learned was that within Christianity there have been three general views about Hell. Each of these three views has been subscribed to by devout and learned Christians throughout the last 2,000 years. The one we're most familiar with is sometimes called "Eternal Torment" or "Eternal Punishment". This is the teaching that Hell is a place of eternal conscious torment. Those souls who are rejected by God (either due to Predestination or failure to receive Christ as Savior) will spend eternity seperated from God in great anguish and agony (whether physical or merely existential is debated by adherents) with no possibility of rescue or relief. Another view is sometimes referred to as "Conditional Immortality." This view is actually closest to what was the prevailing belief among Jews at the time of Jesus. Most of the Old Testament has no concept of Hell and, in fact, little detail about any form of afterlife. The Hebrew word "Sheol" simply means "the grave." Around the time of the Babylonian exile a belief began to gradually develop that at some point in the future God would reconstitute and resurrect righteous individuals from the grave (see Ezekiel's valley of dry bones in chapter 37). These fortunate resurrected ones would continue to live on the earth. By the time of Jesus, this was a commonly held belief (although the Sadducees didn't accept it). You will notice that much of the talk in the New Testament is not so much about "Heaven" as it is about "ressurection." Many historians and archaeologists believe that the unusual Jewish practice of "second burial" which was in vogue at the time of Jesus (in which the family of the deceased would disinter the body a year after burial --after the flesh had rotted away--and place the bones into an ossuary) was directly related to the belief in bodily resurrection. A variation of "Conditional Immortality", called "Annihilationism" is held by Seventh Day Adventists and Jehovah's Witnesses, among others. This view teaches that all will be conscious after death and will stand before God's judgement, but those who are rejected by God will cease to exist rather than be sent to Hell. The third general view about Hell which has been held by Christians is sometimes called "Universal Reconciliation" or "Christian Universalism" or "Trinitarian Universalism" (not to be confused with "Unitarian Universalism"). This position teaches that Jesus' atoning death and resurrection were efficacious for all people. Several of the early Church Fathers, including the most distinguished early Christian theologian, Origen (185–254), believed in Universal Reconciliation (often coupled with the belief in a limited period of afterlife punishment prior to acceptance into Heaven). According to this view, Hell, if it exists at all, is a period of correction and refinement for the purpose of redemption, reconciliation and restoration. A couple of hundred years after Origen, Augustine (himself a staunch supporter of the Eternal Torment view) wrote, "There are very many in our day, who though not denying the Holy Scriptures, do not believe in endless torments." Surprisingly, I find that the strongest New Testament scriptural support is for the Univeral Reconciliation view, followed by the Conditional Immortality view. The view that I find least supportable by scripture, but most supported by Church tradition, is Eternal Torment. Each of these views carries ramifications. If, like Augustine, I believe that man's default destination is a Hell of eternal conscious torment (due, at the very least, to Original Sin--another highly debatable doctrine which carries profound ramifications), then that is certainly going to color how I perceive the value of people in God's eyes. What does it say about people if God's default position towards mankind is wrath and punishment (a punishment which is endless and serves no constructive or redeeming purpose)? Additionally, saving people from Hell becomes of paramount importance. Earthly concerns of social justice become insignificant in light of the awful possibility of irrevocable eternal suffering. For example, John MacArther has stated, "The only reason Jesus came was to save people from Hell....Jesus had no social agenda....[He didn't come to eliminate poverty or slavery or]...fix something in somebody's life for the little moment they live on this earth." (reference courtesy of Brian McLaren--http://www.youtube.com/watch?v=OH1yOmij7Q4). If, on the other hand, I believe that Jesus died to save all mankind and that He was successful in that endeavor, I suddenly see every person as a redeemed fellow citizen of Heaven and an object of God's unfailing love (even though they may not know it yet). God's default position towards them is love, reconciliation and restoration. If that's the case, I am apt to be much more concerned about seeking their welfare during this life. It has been said that we become like that which we worship. If the God I worship is one who has written off most of humanity and (perhaps regretfully) consigned them to eternal isolation and torture, how will that influence the way I see people? If, on the other hand, the God I worship intimately cherishes every individual and has, in Christ, successfully saved each person from the ultimate effects of their sin, will that not cause me to have "soft eyes" towards them? Do you see the contradiction? How one deals with this tends to define what theological "camp" one ends up in. If you accept #1 and #3, you must logically reject #2. This would make you a Calvinist (named after John Calvin, although it was really Augustine who established this doctrine): God has sovereignly decreed that only certain "elect" individuals are predestined to be saved (which, by implication, means that He has also predetermined that the remainder will not be saved). Those who were not predestined for salvation will either go to a Hell of eternal conscious torment or will be annihilated, depending on which doctrine of Hell you subscribe to. If you accept #2 and #3, you must logically reject #1. This is the Arminian position: God would like to save everyone, and sent Jesus to do so, but His will in the matter is trumped by man's free will. God can only offer the opportunity for salvation; man must decide whether or not to accept it. If they reject it, (despite God's will) they will go to Hell or be annihilated (again, depending on one's view of Hell). Calvinists argue that Arminianism denigrates the sovereignty of God. God's intentions are thwarted. If you accept #1 and #2, you must logically reject #3. This is the view of adherents to Universal Reconciliation. This view preserves the sovereignty of God. God has accomplished what He intended to do. Arminians would argue that it denigrates man's free will. Because of my own experiences and studies, I've come to believe in the third position. I believe in Universal Reconciliation. I still remember the moment that the acceptance of this view crystalized in my heart. I literally cried out aloud, "This changes everything!" It has. It radically changed how I look at the world and other people. I no longer think in terms of "us and them" or worry about who is "in" and who is "out". I see God actively working in everyone's life with the ultimate goal of their redemption. Some, due to circumstances or free will choices, will have a more difficult journey, but the ultimate destination is the same for all of us: Home. I find myself overcome with awe and gratitude to a God and Christ who has completely overcome sin and death with love and life. He has accomplished His will. He has succeeded! He is victorious! I am inexorably drawn into worship of a God like that! I am also much more concerned with social justice issues. Also, perhaps counter-intuitively, I am much more interested in evangelism: I want people to know about the wonderful opportunity they have to walk with God and experience His love here and now as well as throughout eternity. Abraham Lincoln once said that the best way to destroy an enemy is to make him a friend. I believe that God will destroy His enemies, not through violence but through love. I believe that, as scripture says, "every knee will bow, in heaven and on earth and under the earth, and every tongue will confess that Jesus Christ is Lord, to the glory of God the Father" (Phil. 2:10-11) and that this bowing and confessing will not be the involuntary forced tribute of conquered enemies but rather the wholehearted freewill praise of a gratefully reconciled humanity. The former would be a phony glory; the latter would be true glory. As Quakers like to say, I believe that there is "that of God" in everyone and therefore that I should treat everyone with honor and respect and consider that perhaps they have something to teach me as a result of the way that God is working in their lives to reveal Himself as He draws us all closer to Him.